Did you watch Chris Froome (Team SKY) on Stage 8 of the Tour de France? During the last 7km he was able to ride faster than any of his competitors. It was mainly a steady, hard pace that allowed him reach the finish line more than 1.45min before his worst opponent. I’ve seen a few discussions about whether Chris Froome is clean or not (based on his power to Watts ratio on that last hill). I won’t go into that discussion. Instead, I will point out three legal and very important ingredients that Froome has used in his preparation to maximize his threshold power. And you can actually implement these strategies in your training formula today. If you aim to increase your threshold power you need be consistent. This means you have to stick to your training program day after day, week after week, month after month, for however long it takes to reach your goals. Significant improvements of threshold power won’t happen overnight. So take a long-term approach: Each workout should take you a little closer to your goal. Keep in mind that if you really want to improve your threshold power and cycling abilities overall, you need to be patient. Allow yourself the time to improve and reach your cycling goals. Commit to work hard each and every time you hop on your bike and make sure you do your best to maximize your results. One of the best ways to achieve better results without working harder is to add structure to your training. A solid training plan is both motivating and will boost your threshold power. If you don’t think you can stick with a structured program then you might be better of with a different approach. By making Tuesdays and Thursdays interval days and Saturdays or Sundays for long rides, you will get some basic structure to your training that will accelerate your progress. This is much better than riding without any structure or training plan. Interval training is my favorite way to boost threshold power. Adding structured interval training two or three times per week will help you ride significantly faster within four to six weeks. The majority of intervals should be sub-threshold intervals. Though, there is no doubt that adding threshold power and VO2 max intervals to your training program very likely might be the missing ingredient to reach your physiological potential. If you are not time crunched, adding a few long distance steady pace rides, will add more power to your aerobic engine. So even though I don’t know Chris Froome’s training program, I’m pretty sure that the above three ingredients are cornerstones in his daily training routine. Take advantage of these simple, but very effective and proven methods to improve your performance. Who would have ever thought that the hot contender for the yellow jersey in Paris would ride consistently, have structure to their training program and include intervals within that structure. I’m sure this sets him apart from the rest of the peloton with few, if any, of the other professional cyclists employing such as rigorous approach to training for the biggest race in the world. @Jimmy – If my goal was to illustrate why Froome is the strongest rider, I would choose different reasons than the 3 basic ingredients mentioned above. 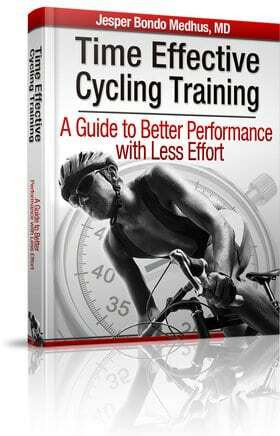 I could have shown 10 advanced training principles that could potentially add up as marginal gains. That would probably have been a lot more entertaining story to read. I wanted to point out three basic principles (consistency, structure and interval training) that will actually help ordinary cyclists. This might sound like very unambitious and unsexy advice, but I guess more than 95% of my readers will benefit more from optimizing these three factors than playing around with marginal gains like switching from 53 to 54/11 on specific stages, aggressive cool down strategies, regular jersey vs TT jersey, stage analysis, pedaling frequency strategy etc. I’m afraid many readers lose focus when they read such advice and they believe the secret to better performance is to use some of the most advanced training methods developed for pro riders. Nevertheless, there is a great risk that some of the most fundamental and effective principles will be overseen. Good reply Jesper. I’ve lost count of the number of club cyclists I know who spend thousands of euro on lightweight bikes and yet they won’t spend either the time or the money to invest in a basic training plan. 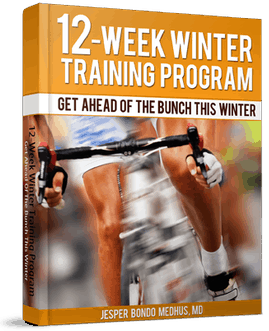 I used your 12 week winter programme & saw big improvements in my VO2 max, body fat levels, power/weight ratio and average speed. In my experience, very few club cyclists are aware of the importance of structured, consistent training. They usually train on the basis of how they feel or how fast their training partner is going! Nice post, Jesper. I’m pretty sure commitment to being consistent, structure and intervals in your training are the underlying basis for all types of training. Although, I still need help with the consistency part of it! I will agree with you on the first two points, but I guarantee that if Froome was doing a lot sub-threshold intervals he would not have won the tour. Intervals are by definition above threshold, otherwise they would be useless. I watched Froome during several attacks and it was clear that he trained to drastically increase his cadence to produce power, taxing his cardiovascular system to the max, but saving his legs to some extent. I think this is the link most cyclists are missing because they’re spending way to much time working on their sweet spot, threshold or whatever else its being called. Nice blog, though. We need more performance analysis as it can be applied to regular folks. I disagree. Where is your reference for that definition? The 3 ingredients should include the one that Froome himself goes on about and which is very evident on every tv picture of him. KEEP YOUR WEIGHT DOWN. Froome targets 67kg, about 5% below rivals of similar height, giving him an advantage on ascents. I suspect this is achieved by Sky nutritionists who ensure optimum protein and nutrients with minimal calories.